"In equestrian art the rider and the horse must have reached a state where all tension and contraction are eliminated, thereby establishing a deep communion by which a spectator, ignorant or not of the subtleties involved in the Art, but having a deep sensitivity, can appreciate this sublime beauty, in the same way he appreciates great moments in any artistic production of ballet, concert or theatre." "You can breathe a horse to quietness." "Improving your horse's comfort can improve yours as well!" "No mater what your riding discipline, in order to do productive and rewarding work you want a relaxed, calm horse. Relaxation should be a priority because for the most part, attempting to train a tense horse is a waste of time and not very pleasant for either one of you." "Especially under highly goal-oriented conditions, we can lose track of how fundamentally success depends on ease and freedom." "Whoever causes constant tension and pressure on the horse's back and in the rein contact, cannot relax a horse." "Only musculature that is able to relax will lead to a beautiful and harmonious way of going." "Relaxation, however, does not mean limpness. Muscles must be engaged but not tense." "Just being relaxed in the waist encourages the horse to go forward." "...no athlete can perform well with tense, jerky movements." "Relaxed muscles — both his [the horse's] and yours — do not load up with poisonous wastes that cause both fatigue and tying up." "I often use breathing to relax both the horse and myself, and to help develop concentration." "Only with a relaxed swinging back is the horse able to utilize the full potential of his locomotive system." "The horses can get real bothered about what's taking place when they don't understand it. So we need to spend quite a bit of time with these horses and help them get relaxed." "After I got onto better posture and the timing of the feet, I found it was important to get a horse to mellow up..... That mellow feel is really more about the way his mood and his mind are, but there's a place in there where his body takes part in his understanding of this mellow feel. It's when he isn't pushing on you at all. His head doesn't come up and it takes a normal position." "...the more these horses get so they feel of you, why the security they need comes from you, and that gives you more control. The horse will really take something good from a rider who's able to reassure them." "...we're in hopes of keeping that horse nice and relaxed no matter what we want him to do." "A horse needs to stay confident and relaxed about what you expect, and that's most important." "I like to keep the horse feeling settled and pretty soft in my hands, but still completely attentive and responsive to me throughout his whole body." "Equestrian art is the perfect understanding between the rider and his horse. This harmony allows the horse to work without any contraction in his joints or in his muscles, permitting him to carry out all movements with mental and physical enjoyment as well as with suppleness and rhythm. The horses is then a partner, rather than a slave who is enforced to obey a rigid master by constraint." "In order to work the horse as he should be worked, with suppleness and lack of contraction, his spinal column muscles must not be over tense." "The horse must be taught to piaffer, by calming him, and not by exciting him." "...a horse who keeps his back muscles tense when saddled will experience a restricted range of motion. He will also suffer from degenerative, career-impeding issues far earlier than will the horse who is enabled — through correct training and saddle fit — to carry a rider on his back with muscles that are flexible and elastic." "A confident and relaxed horse performs better and learns better. "When a horse uses his back correctly and is free of pain, forward movement becomes effortless and supports the rider." "Little by little my horse learns to stay relaxed as I add activity by increments...."
"[John Lyons says,] 'The horse must be calmer at the end of your training session than he was at the beginning.'" "It is very important for the horse's early education to include sensitivity and calm while promoting the horse's self-confidence." "If a horse goes above or below his individual tempo (most horses rush and go far above the appropriate tempo), he can neither relax nor find horizontal balance." "A critical indicator of a correctly trained horse is a back that is supple, carried, positively tense, but relatively relaxed." "The first, and perhaps most important goal, is to relax the horse, after which the objective is to find the rhythm and drive." "The swinging back makes your ride more comfortable besides making the horse's work easier for him." "By concentrated thought and gentle movements, by seeking perfect balance, I persuade the muscle to release its tension." "...I think it is so important to spend time reassuring a horse and helping him relax rather than treating him with rewards." "Only the rider who is free from any contraction will have a horse equally free from contraction." 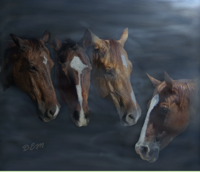 "When you hold your breath, you build certain tensions in your body to which a horse will react." "I see many people who have ridden with locked elbows for some time — even years. The horses they ride usually have shortened strides because they feel that they can't move their heads and necks for balance." "By gracefulness I mean an air of relaxed and easy competency that a rider must be able to maintain with correct posture and an independent seat in all of the movements that a horse is able to make." "Relaxation in the saddle is absolutely key to becoming a good rider." "...once the rider is confident that he can stop the horse and get off, come what may, he relaxes and becomes a better rider..."
"It is easier to lengthen your legs down horse's sides by releasing muscles around your hips, knees, or ankles so that your weight drops into the stirrups than it is to shove on the stirrups or to reach for them with your toes." "It is easier to sit taller by releasing the muscles around your gut and rib cage than to hike your chest up again and again." "Ease and effortlessness come from working with the laws of Nature, especially gravity and balance." "...you can pull your chest up out of a slump, but it also works very well to release the muscles that were pulling your rib cage down in the first place." "If the skeleton is aligned with gravity, the bones support each other without much need for muscle action." "Balance and good posture come at least as much from releasing muscle contractions so bones can line up the way they are designed as from contracting muscles to hold bones in place." "...you really want to do well and get so tense that the horse doesn't know any more what the person on his back wants him to do because of abnormal pressures and body language." "You concentrate so hard on avoiding errors that you cause exactly the ones you are trying to prevent." "The better command a rider has of her art, the less she works physically." "If you are not relaxed, you cannot apply the aids effectively." "You must be supple in your back to ride well, so simply stretch upward to straighten up, making your pelvis straight up and down and letting your stomach hang loose so you are relaxed in the waist." "Do not ever try to force yourself into position since that destroys relaxation." "Do not try to keep your legs stationary; when they are relaxed and on the horse, they will have some motion corresponding to his motion."